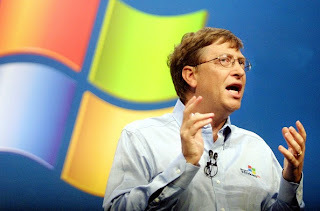 Why, Mr. Gates, Will Windows 8 Dominate the Market? The article went on to quote Gates as describing users of iPads as frustrated because "they can't type, they can't create documents, they don't have Office there." It appears that Gates hasn't had the pleasure of using one of his competitors' devices, however, because that statement couldn't be further from the truth. You can connect any number of Bluetooth keyboards to give you that old familiar physical feel, and many tablets will also recognize a Bluetooth mouse. Some larger tablets even have standard USB ports into which an ordinary desktop keyboard can be plugged. As for creating documents and using Office, there are countless apps (including free ones) that allow users to view, create, and edit Microsoft Word and Excel documents. Even taking into consideration the fact that Microsoft's tablet device is a new competitor in the market, I don't have very high hopes for it and I don't think I'll be relying on Gates' psychic abilities when it comes to building my stock portfolio. Even though Microsoft's stock price is up nearly 24% YTD, I'm not going to run out and grab some shares simply because Gates predicts that his company's product will soon take over the market and revolutionize the industry. If anything, I'd be much more likely to invest my money in Google Inc (GOOG) or Apple Inc. (AAPL), since those companies have demonstrated a consistent ability to remain on the cutting edge, and both have revolutionized the industry in their own ways. Google's stock price is up slightly more than 22% YTD, and Apple's is down nearly 13% YTD. However, we all know that those figures don't tell the whole story. Being a long-term type of investor, I focus more on a stock's performance over at least five years, plus consider the company's ability to remain innovative and adapt to a changing landscape. Looking at five-year performance figures, Microsoft is up about 12.5%, Google is up about 48.7%, and Apple is up almost 156%. Examining those numbers alongside more current values like price-to-earnings ratio and earnings per share figures, Microsoft isn't nearly as impressive as Google or Apple. Microsoft's PE is 16.96, Google's is 25.84, and Apple's is 11.08. But, what might be more indicative is EPS, which is $1.94, $33.59, and $41.89 for Microsoft, Google, and Apple, respectively. To be clear, I'm not suggesting that Microsoft's Windows 8 devices, like the Surface Pro tablet, will be a complete failure. Obviously, there are a number of people who prefer the Windows OS (just over 7.5% of the market). However, the design, speed, and functionality of Androids and iPads are just too far ahead of anything that Microsoft will be able to produce. The company is entering the tablet race after its competitors have already pulled so far ahead that they're barely visible. The issue, though, is not one of physical specs or software limitations, as Gates described in his prediction for the future of the tech market. Instead, the issue that will most dramatically negatively prevent Microsoft from capturing significant market share is the Windows operating system. As most of the computer world knows, Windows has always been glitchy and temperamental, resulting in a computing experience that often ends in repeated bouts of frustration, pulling your hair out, banging your head on the desk, or (my personal favorite) heaving the darned machine out the window. Since Microsoft hasn't really changed the internal programming structure of the Windows OS, at least not significantly enough to alleviate the common inconsistencies and troublesome glitches, most consumers are likely to assume that Windows 8 devices will experience the same issues. This fact alone will continue to steer buyers to competitors' devices. Google, on the other hand, designed the Android operating system around the open-source Linux operating system, which is a much more stable, although unpopular, platform. Similarly, Apple's devices run on the company's proprietary OS, which has been renowned for its awesome stability. Microsoft's Windows OS may be more popular with the mainstream desktop PC community, but that certainly doesn't translate to a better or more popular mobile device. And, just because Microsoft decided to enter the tablet arena doesn't make the company's stock more valuable or desirable. I must admit that I've always respected Bill Gates and his ability to lead one of the oldest and largest technology companies. The man is a member of the board at Berkshire Hathaway Inc. (BRK.A), so if Warren Buffett values his opinions then who am I to question them? Well, in this case, I think I might get more accurate insight on the future of mobile electronics by calling The Psychic Hotline than by listening to Gates' most recent predictions.